I’m a bit sad to say that this E30 M3 Project is now coming to an end. 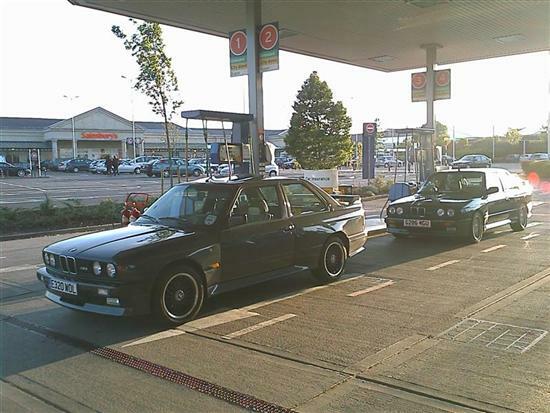 Hot on the success of the exhaust work in Birmingham, Ben Smith and I have driven up to Harrogate to see James Byrom, and to view his E30 M3 which is up for sale. It’s a later (1990) model in the same colour, but boasts a few improvements such as the revised engine (extra 15bhp and 10lb/ft), 15,000km less, short shift kit, leather, and some other nice touches. It’s got a lot of little niggles, most of which stem from some extremely dubious stereo installation work that’s taken place in the past. As a result the front doors leak a bit of water in heavy rain, but new waterproof sheets should sort that. Otherwise there are a few interior bulbs that need sorting, the spare wheel clearly isn’t even designed for the car, no remote central locking, it needs a good clean and general sort out, but it seems to be in solid condition overall. The 235 mile journey home is thoroughly enjoyable. With some great driving music on WOL’s system and WGU in the rear view mirror, we attract so many appreciative nods, glances and thumbs up on the A1 southbound that it drives home what motoring is all about. These cars are epic; everyone interested in driving should at the very least drive one. Ultimately WOL will be up for sale in the near future, and I’ll be turning my attention to WGU. Someone somewhere is going to buy a car that I hope will put a proper smile on their face.